The power of philanthropy has been transformational for The Neuro. The philanthropic vision and generosity of our donors has enabled The Neuro to remain at the very forefront of health research and patient care for 8 decades. 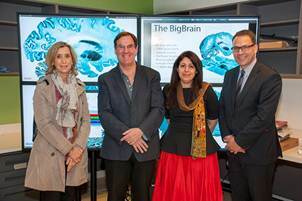 A $1.6 M gift from the Marcelle and Jean Coutu Foundation is providing pivotal support for autism spectrum disorder (ASD) research at The Neuro that combines the latest in neuroimaging and clinical data with genetic information – a groundbreaking new approach to studying the disorder. Dr. Alan Evans at The Neuro, one of the world’s most eminent authorities on ASD is advancing research into the disorder. His work has revealed that significant differences in the brain development of at-risk infants may be detected before the appearance of autism symptoms in the infant’s first year of life – offering new clues for early diagnosis. Until now, most children are not diagnosed until after age two or three. Early diagnosis is key as research suggests that autism symptoms can improve with early intervention. The new trail blazing research builds on this work, approaching ASD from all angles. Dr. Evans’s multidisciplinary research, with local and international collaborators, aims to identify biomarkers for early intervention. The research combines state-of-the-art imaging technologies and computational strategies to map brain structures and function in normal development and brain disorders, with genetics and epigenetics, which explore the influence of our genes and environment on brain growth and disease.